Ok, lazy question. Do you sew your ends in or knot them off for a generic blanket. I know sewing them in is prefered for sensitivity reasons. But what about out when that is not an issue. Love crochet, but I hate sewing in ends, and I have at least 60 more to go on this afghan. Finally finished the ends, and washed. Thank you for your help. I decided against a border on this one. Turned out to be 70" x 45" before I started running out of dark purple. As promised, final pic. Thank you! I went ahead and wove them in. I know better than know, but was getting impatient and lazy at the end I guess. Good to know about the knots in skein. I have been clipping them, leaving a tail and weaving them in. ReniC, Much better things to drool over on this site than me using up my purple. Lol. Here is where I'm at so far. Going to do another rotation, sew in my 70 some odd ends, then decide what I'm going to do. what knot is this and how should it fit it. ok, newbe question. If you are working a square. Could you not work to the corner, Chain what you need to raise a level, crochet back to the center, slip stich down, crochet back to other corner, chain up, work back to the center. 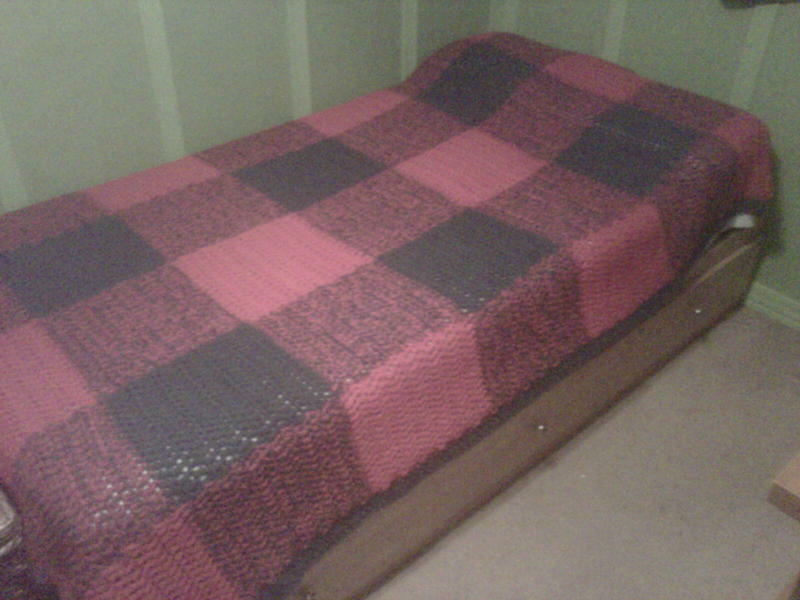 This would add 2 rows to one side, and begin the half row of the granny on top. Go down ths side of the piece to the other side and repeat. Once you close the granny you have now added 2 rows to both sides and added 1 full granny. Would this make it look bad? Jason hmmm, did not see the pictures before I posted. Willing to bet this would not work for that stitch. But I have to wonder if it would work for the granny I learned on. Well..... With that as a rule of thumb. I guess I could 1 into the single 2 into the double 1 into the next single 3 into the next double Repeat till half way. the next 2 doubles that i would put 3, I only put 2. Then reverse to 3 , 1, 2, 1 That would put me at 155. Am I over thinking this?